Home » Bollywood News » Thugs Of Hindostan Advance Booking Update: Aamir Khan To Break His Own Records! The advance booking for the film started on Saturday but it wasn’t fully fledged. It took a couple of days to open for all the screens. 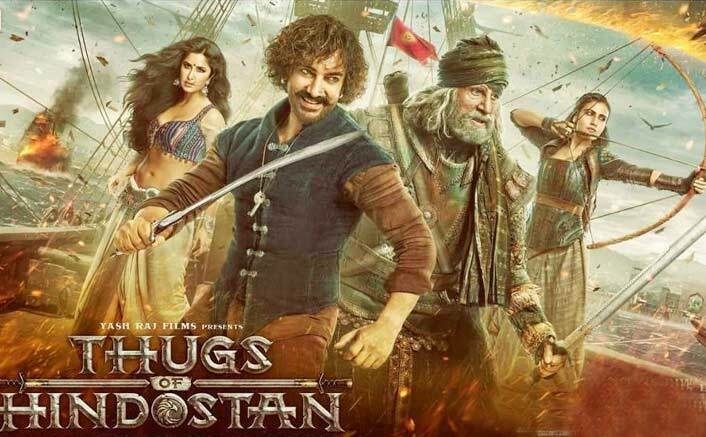 Thugs Of Hindostan Advance Booking Update: Aamir Khan, Amitabh Bachchan, Katrina Kaif and Fatima Sana Shaikh’s upcoming magnum opus is all set to release on the 2nd day of Diwali. The advance booking for the film started on Saturday but it wasn’t fully fledged. It took a couple of days to open for all the screens. Let’s analyze how the advance of the film has been doing in the major 5 cities of the country. Subodh Bhave’s Marathi film Ani… Dr. Kashinath Ghanekar will surely eat up some business in Mumbai because it’s highly anticipated amongst a certain section of the audience. The start for Thugs Of Hindostan is in the range of good to very good but it’s not excellent. Yes, it will pick up from today and tomorrow should display a clear picture of the same. Delhi has got more shows than Mumbai and also the booked shows are more than it. The oranges (almost full/filling fast) are more than Mumbai and it seems it will be all orange by tomorrow. A bumper figure from Delhi is on cards for sure. Pune is known for its spot booking but this time it’s a totally different scenario. The movie is clocking huge numbers for sure. It’s running riot in Pune and will surely see houseful boards by tomorrow. Bigg Boss 12: TRP Is All Set To Touch An All-Time High With Salman Khan & Shah Rukh Khan! There is an average response here too, 30% of the shows are filling fast and few of them are sold out. It’s expected to show a jump from tomorrow morning and it’s on similar lines as Golmaal Again as of now in this city. In Chennai, Thugs Of Hindostan will face the heat from Vijay’s Sarkar as it has almost double the shows on Thursday. A pretty ordinary situation, yet again, for the Aamir Khan and Amitabh Bachchan film there. Things will start to get clear from tomorrow but as of now, it’s not on the expected record-breaking lines but the upward trend is a good sign for the film. Stick to this space to get an updated report of the same.